Barça struggle again with 1-1 draw to Valencia. 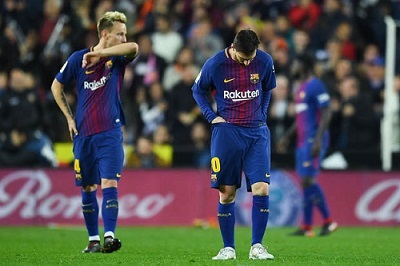 FC Barcelona winless streak in La Liga was extended to four after being held by Valencia1-1. Ezequiel Garay gave Valencia the lead after just two minutes perfect start inside the opening two minutes when was left unmarked to head in Dani Parejo’s corner. The Blaugrana struck back twenty minutes later courtesy of Messi, after he scored from a low long ranger effort from outside the box. Unfortunately, Barça could not score the winner, and fortunately neither could Valencia, and the game ended in a 1-1. This result meant that FC Barcelona relinquished top spot atop of the standings to Sevilla, who have 16 points, one more than the Blaugrana. Barça will return to action, following the international break, on October 20 when they host league leaders Sevilla. Goals: 1-0, Garay (min 2); 1-1, Messi (min 22). Cautions: Carlos Soler (min 43), Parejo (min 58); Suárez (min 41), Coutinho (min 58). Previous PostBarça end winless streak with 4-2 victory over Spurs. Next PostBarça defeat Sevilla 4-2 but lose Messi for 3 weeks.